Of dark and starless waters. Poet’s Notes: This is my attempt to capture the feel of a Lovecraftian horror: an existential terror borne of the terrifying inversions of irrational chaos. The identity of the entity is never established, nor is it meant to be. I did not want to fixate on the nature of the horror, only allude to it being from far beyond human reckoning. "It was a wrinkle on an abutting brane / A shadow cast upon the underside / Of the luminiferous aether"
It is further conceived in terms of a hunter, a living being which has passed us like a shark in the sea. In the first stanza, I reference water and I return throughout the poem to this. We go from earthly waters—the actual sea, shrouded in midst—to the "dark and starless water" of an "abyssal sea". These waters are the formless depths prior to creation, the chaos from which God made order, or Marduk slew Tiamat. The poem concludes with the terror of wondering whether we have somehow drawn its attention. Whether we have somehow beckoned our destruction by too noisy an existence to be ignored. The final verse is stand-alone, mixing the terror with the water in the sensation of drowning. I do not recall how long it took me to write this nor if I wrote it on the subway or at home as I wrote this about a year and a half ago. 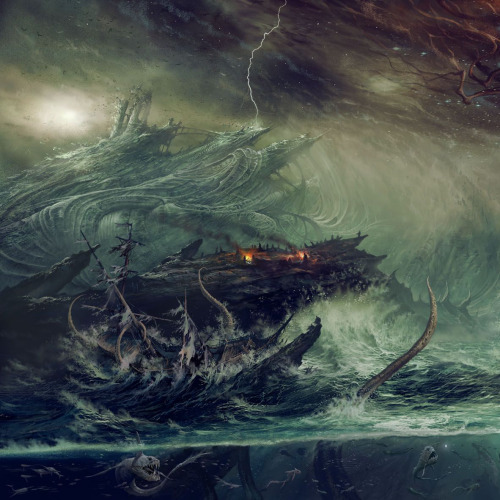 If I were to hazard a further guess at my inspiration aside from wanting to write a creepy poem, I suppose one could say my fear of the endless depths of the sea factored into the extensive references to the depths. Editor’s Note: This one gives me chills! The mood is one of contemplative horror--deliciously terrifying yet somehow also calm--like the calm before an amorphous monster strikes. Rowe’s use of assonance and consonance is absolutely breathtaking.